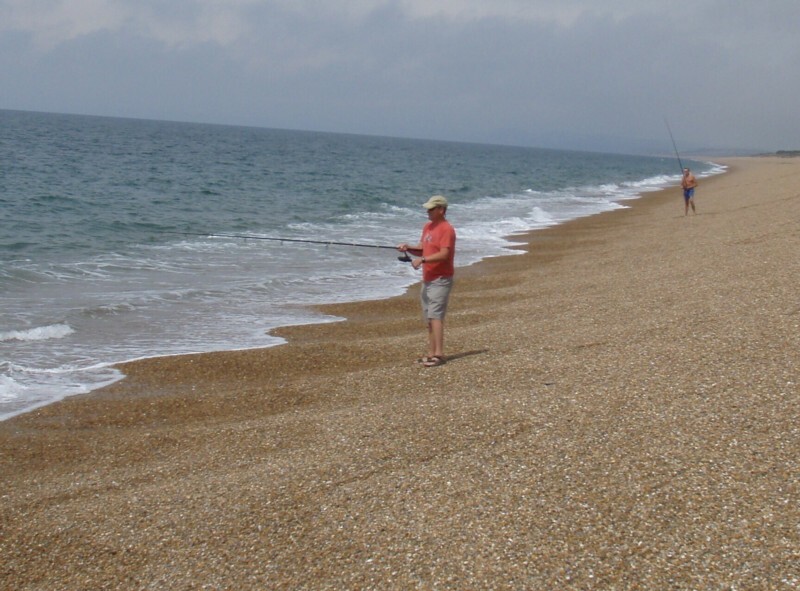 Last year I had promised Lynn that we would go to Dorset and catch a few mackerel and BBQ them on the beach fresh. Time went by and the summer slipped away into autumn and the opportunity went by. This year we had decided that the situation needed to be righted. She soon had us booked up in a B&B in Weymouth and on the 14th we headed down to Dorset. I’ve not been to Weymouth since I was at Sunday school which is a very long time indeed. We wandered around Weymouth and talking to the guy’s in the tackle shops they said that the mackerel were in along Chesil beach. 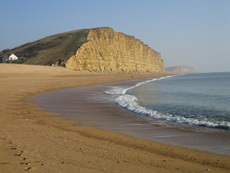 The beach is a barrier which is about 18 miles long 660 ft wide and 50ft high and forms part of the Jurassic Coast which is a UNESCO World heritage site. On the Friday we had a great breakfast in the B&B and we headed off towards the Portland side (east) side of the beach. Here the water is slightly deeper than the west side towards Bridport. All I was using was my 3lb t/c carp rods with 12lb line with a 20ft 30lb shock leader as I was using a 3oz lead to cast out the 4 hooks of lures being used. There were plenty of anglers there however after 1.5 hrs the 15 anglers had only one mackerel. So not good fishing. Rain was forecast for later in the afternoon, so rather than wait we decided to head towards Abbottsbury where you can access the beach again. We arrived to find more anglers here. So we walked along the pebbles, which believe me is hard work as they keep shifting under your feet. We soon found a suitable spot between two anglers. 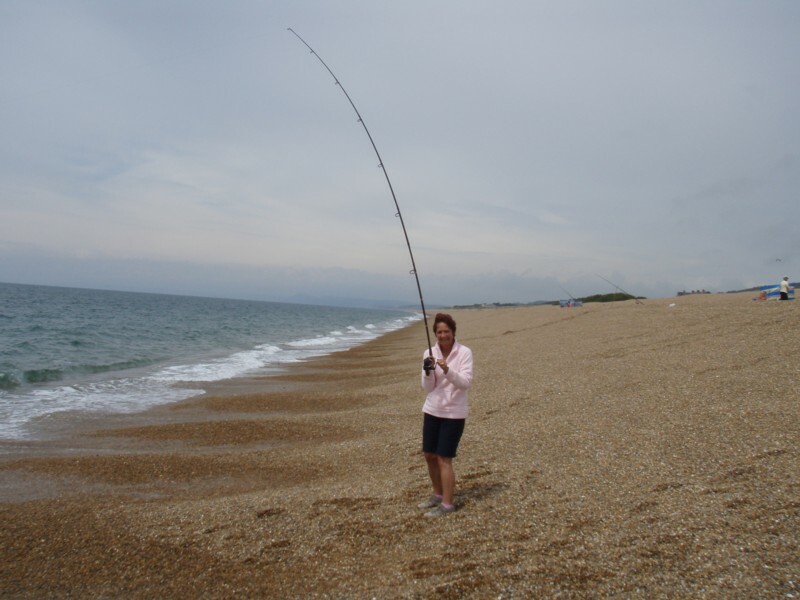 After about 15 minutes of casting and sweeping the rod to the side I had a take from a mackerel which I duly landed. I can’t say that they fight well but it was just nice to catch one and at least we had something to cook, and the hunter gatherer instinct was intact. It was time for Lynn to have a go so I would cast out and she would retrieve. After two attempts she said just one more cast, so I launched the rig into the sea and slowly she cranked the reel handle to wind in the line. I think I've hooked the bottom! I could see from the rod that the tip was being pulled around by a fish. 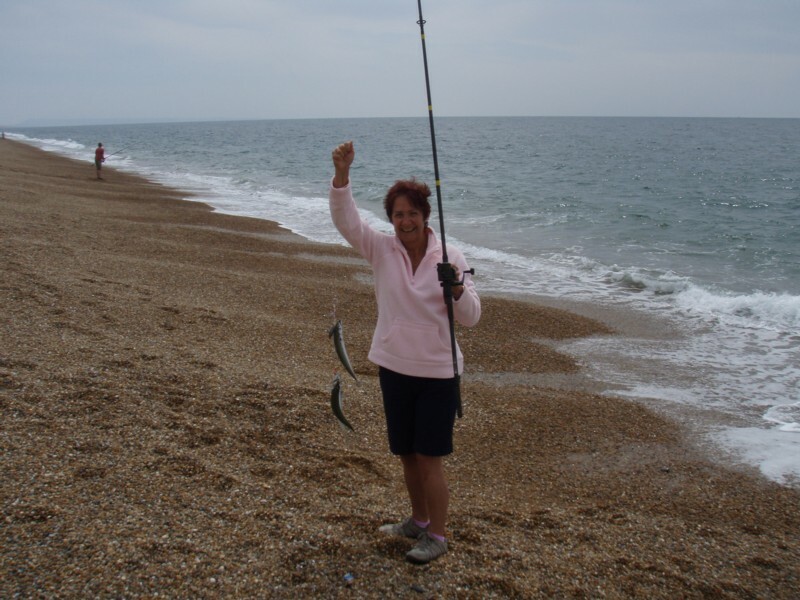 Slowly she wound the line in and as the rig came ashore there were 3 mackerel hanging on 3 of the 4 lures. What a result we had plenty to cook now. It looks like it's only two but there are 3 hanging on here! So we gutted them in the sea and headed towards the car and the BBQ. We only had a disposable BBQ so realistically we could only fit 2 on there, so we kept the others for the landlady of the B&B. We didn’t have any cutlery or plates so it was very much fingers only. 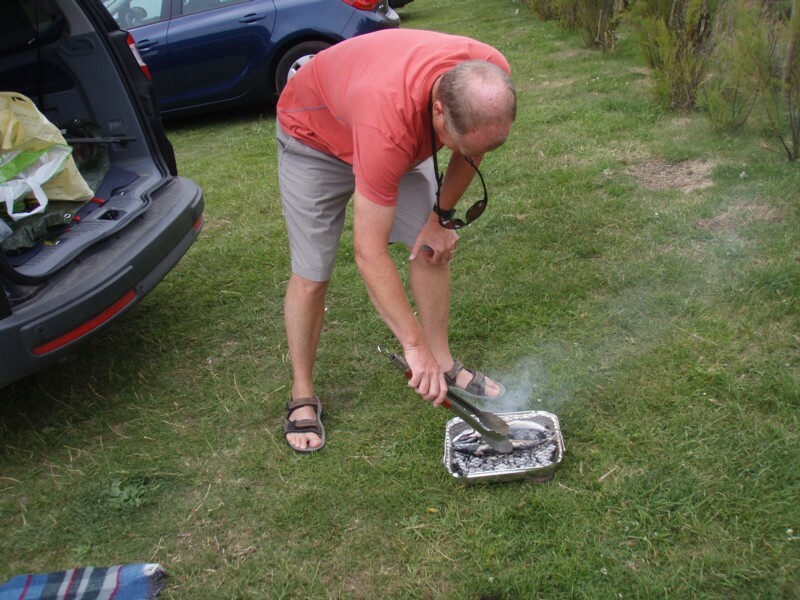 I did have some tongs for turning them over on the BBQ. The taste was delicious and as we said you just couldn’t get any fresher. On the BBQ and very fresh! The Landlady was very pleased with hers and grilled them for lunch the next day. So mission accomplished for the year. This entry was posted on Sunday, July 17th, 2011 at 10:47 am	and is filed under Uncategorized. You can follow any responses to this entry through the RSS 2.0 feed. Both comments and pings are currently closed.